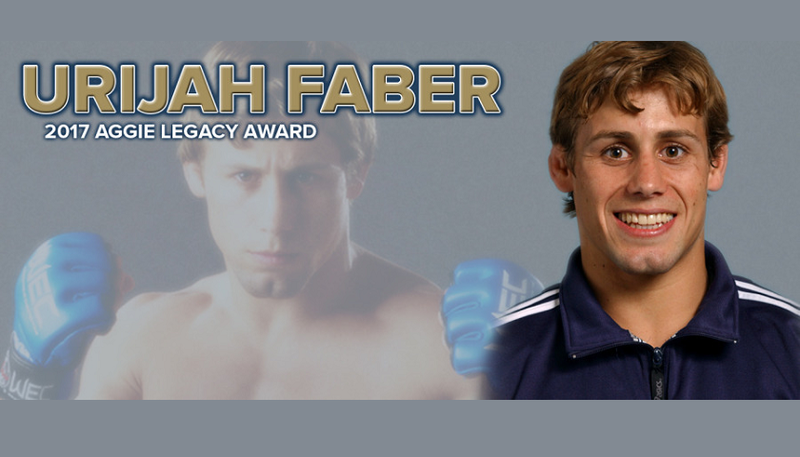 Former UC Davis wrestler and recently retired mixed martial arts superstar Urijah Faber was selected as the 2017 recipient of the Agie Legacy Award, an honor bestowed upon a past Aggie student-athlete who has since enjoyed an outstanding athletics-related career since departing the university. Additionally, Tom Compton will receive the Special Recognition Award for his volunteer service. Both the Aggie Legacy Award and Special Recognition Award are presented as part of the Cal Aggie Athletics Hall of Fame induction ceremony, held this year on October 28 during the university’s Homecoming weekend. Faber is the sixth recipient of the Aggie Legacy Award since the accolade’s inception in 2011. He follows football coach Chris Petersen (2011), triathlete Dave Scott (2012), football player/philanthropist Rolf Benirschke (2013), water polo coach Dante Dettamanti (2014) and football coach Paul Hackett (2016). A two-time NCAA qualifier as a wrestler in 2002 and 2003, Faber went on to enjoy an outstanding MMA career. Under the moniker “The California Kid,” he held the World Extreme Cagefighting featherweight title from March 2006 through November 2008, then enjoyed a heralded career in the Ultimate Fighting Championship form 2010 until his retirement in 2016. Faber finished with a 34-10 career record, later earning inductions into the UFC and Sherdog halls of fame. Compton earns the Special Recognition Award for volunteer service. The former executive director of Campus Recreation and Unions owns more than 30 years of service on the basketball game crew as a timekeeper, shot clock operator and official scorer. Along with those of recent awardees Skip Harrison (2004), Jackie Box (2009) and Jerry Nishimoto (2016), Compton’s efforts help maintain the highest levels of professionalism and integrity in game operations during UC Davis home basketball events. Faber and Compton will receive their respective awards as part of the CAAHOF induction ceremony, which will honor student-athletes Dylan Curtis, Austin Graham, Heidi Kucera and Paige Mintun; plus longtime administrator Bob Bullis. The 2017 induction class was announced last Wednesday, August. 2.